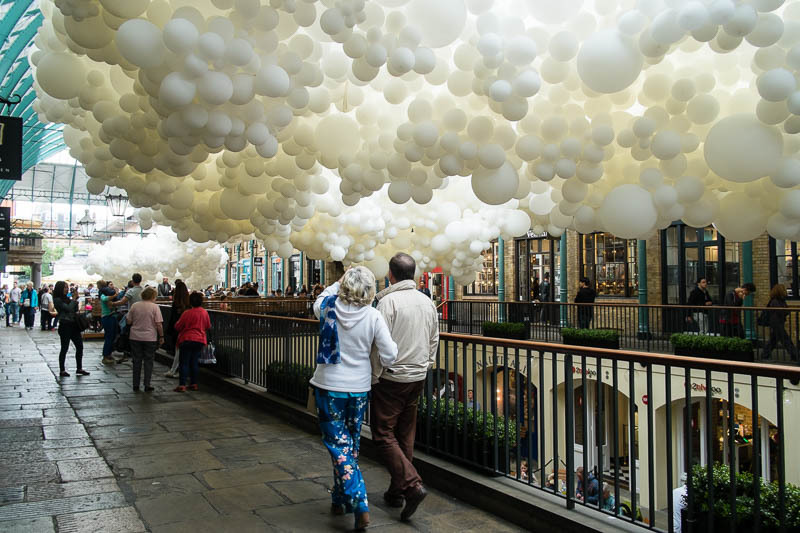 One Hundred Thousand white balloons adorn the arcade in Covent Garden. "Heartbeat" is the installation of French Photographer and visual artist Charles Petillion. Photographs of more of his installations can be seen in a pop-up gallery. The artist uses balloons in his installations as metaphors invading everyday spaces aiming to change the way we see the everyday without noticing. The installation here certainly has everyone noticing. Pop down and take a look and make sure you see the photo gallery as well. What a difference a couple of letters make!! Looking at this wonderful installation I wondered what a 'gallon' was - reading on - Oh right, 'balloons'! Amazing shot of an amazing work of art. Angie has just said what I was going to say. I'll add "astonishing." Clouds of white balloons . . . fantastic. Look what it does to the light. I wish I was there to see this. The photographic possibilities must be endless. At first glance, I thought I was seeing very low-hanging cloud formations or some kind of gasses forming in the air. This is a spectacular sight! Thanks for sharing! It is so wonderful, Mo! On the thumbnail it looks like a steam train passing. How on earth do some people's imaginations work? Tremendously appealing for the photographer! They do look like clouds! I really like the effect. Wow, a fantastic shot !